In March 1851 Charles C. Rich and Amasa N. Lyman, Apostles of the Church of Jesus Christ of Latter Day Saints, Left Utah with 437 people to establish a stronghold for the gathering of saints in California. Jefferson Hunt, David Seeley and Andrew Lytle were captains of organized companies. They purchased the Rancho ‘De San Bernardino, selected a site for settlement, built a fort enclosing 100 homes and erected an adobe building for church and school. 1300 acres of grain were planted, grist and saw mills erected and roads made into nearby canyons. Local government was established and the population doubled. Before the call back to Utah by President Brigham Young in 1857, pioneers from Yerba Buena , England and the pacific had joined the settlement. Here is D.U.P. Marker # 500, where we read of the first buildings in Palmyra, Utah. To the north of the little one-room schoolhouse, the people of Palmyra began building the lumber Amusement Hall on February 10, 1900. It took exactly one month to complete the building, and a dance was held in it that evening. A potbellied stove kept the building warm. There was no indoor plumbing; the outhouses were to the east of the building. For several years, the Amusement Hall was used for church meetings and social activities, including basketball, wrestling, and dances. The Amusement Hall was used until 1933. The first school was built in the Palmyra Fort. The second school, an adobe brick building which measured twenty-four feet by thirty-two feet with a rock foundation, was built across the street in the early 1890s. The entrance was a six-foot hallway with a row of coat hooks around the wall and a shelf above for dinner buckets. There were four rows of double seats with one grade in each row – first, second, third, and fourth; one teacher taught all four grades. There was a potbellied stove in the northeast corner and a blackboard on the east wall. A flowing well was located near the east wall. Horses ridden to school were tied to a hitching post. Some children rode to school in a covered wagon. This school was replaced in 1920. In 1857, Robert D. Covington, directed by Brigham Young, led twenty-eight families to Washington, Utah, to establish the “Cotton Mission.” In 1859, a large structure was built that would serve as a meeting house for the Saints, a way station for the early missionaries to the Indians, and the home of the first bishop in Dixie, Robert Covington. The spacious upper floor, entered by an outside stairway, became a community social center with parties, dances and plays held there until 1877. Built of native Navajo sandstone, it is the oldest remaining building in Utah’s Dixie. The Kennedy Ditch was an early pioneer irrigation canal taken out of Parley’s canyon stream near 17th East. The construction was achieved as a co-operative work project, and the new channel named after its first Water Master, Charles Kennedy, a Utah pioneer of 1848. The area thus brought under cultivation. Covered 864 acres of small farm lands extending west of 13th East from near 21st South northward to 9th South, including this spot on Emerson Avenue. Built by the women of Thurber under the leadership of Sarah Gardner Meeks, President; Mary H. Bullard, 1st Counsellor; Eliza Jane Brinkerhoff, Amanda Haws Durfey, 2nd Counsellors; Viola Cutler Brinkerhoff, Secretary; Mary A. Gardner, Asst. Secretary; Melissa Meeks Snow, Treasurer. Building began June 1, 1897 when the town was moved to its present location. Completed September 19, 1899 and dedicated by President Willis E. Robinson. In 1876-77 Escalante Pioneers erected a log building, 36×18 ft., located 20 feet west of this marker. The logs 18″ in diameter, came from Cyclone Lake Mountain by ox team. They were hewn by hand, fastened with oak pins, morticed ends and chinked with lime mortar. It had white sandstone foundation, one door, three windows on each side, and shingled with white pine shingles. Desks were boards hinged to the wall. Seats were split logs, flat side up, no back. Building used for school and all public gatherings until 1885. Teachers – Jane S. Coleman, Mary Ann P. Schow, John Miles. Building vacated in 1898. In 1866 a group of Mormon Cavalrymen noted this valley, while in pursuit of Indians, during the Black Hawk War. In February, 1875, a company of men came from Beaver, Utah and explored the valley. The first permanent settlers arrived November 1875. The town site was surveyed, homes built and a bowery erected. July 4, 1876, in absence of a better flag, they hoisted a striped Navajo blanket. The city was named for Father Escalante, a Spanish priest who visited Utah in 1776. Organized as a Latter-day Saint Ward August 5, 1877. Utah South Company Daughters of Utah Pioneers, in conjunction with the City of Spanish Fork, community donors, and volunteers have reclaimed and restored this hallowed ground in remembrance of the pioneers who persevered through uncommon hardships because they had faith in their God and in their cause. The pioneers chose this bluff overlooking the river as their sacred burial ground. We reverence the lives of these stalwart settlers who came into a barren land and built on a foundation of faith. Settling a community was arduous, backbreaking work that required unity. They lived in wagon boxes, tents, and dugouts along the river bank. They plowed, sowed crops, herded cattle, irrigated, and built roads and bridges. These pioneers were dependent upon one another for their very survival. When death occurred, they mourned together. The first settlers arrived in 1850. Their life and death struggles while facing hunger, hostile natives, disease, grasshoppers, and crop failure are heroic and heartrending. 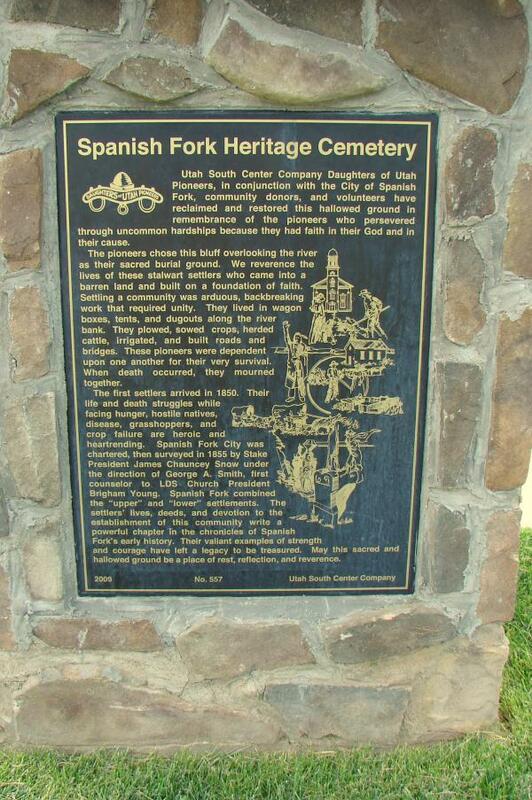 Spanish Fork City was chartered, then surveyed in 1855 by Stake President James Chauncey Snow under the direction of George A. Smith, first counselor to LDS Church President Brigham Young. Spanish Fork combined the “upper” and “lower” settlements. 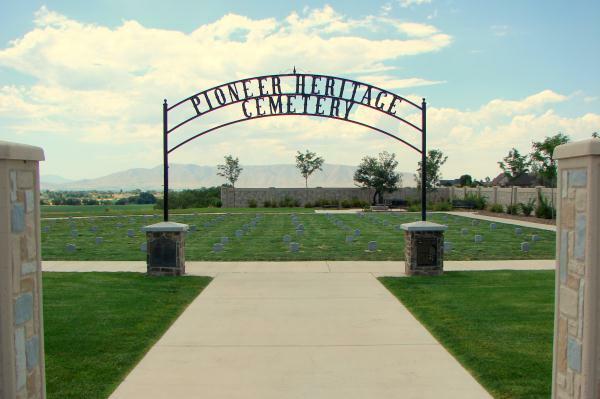 The settlers’ lives, deeds, and devotion to the establishment of this community write a powerful chapter in the chronicles of Spanish Fork’s early history. Their valiant examples of strength and courage have left a legacy to be treasured. May this sacred and hallowed ground be a place of rest, reflection, and reverence. Early in 1876 Andrew Jackson Allred was called by Brigham Young to lead a group of settlers into Rabbit Valley, including ten members of the Allred family, W.W. Morrel and son Silas, William and Henry Maxfield. They built their homes east of Fremont River but due to floods, moved westward to a point of the hill. Here were established log cabins, trading post, store and post office. One half mile further south the first burr grist mill was erected. Mr. Allred served as first postmaster and Indian interpreter. Only the grave of little Silas W. Morrell remains in Fremont’s first cemetery. I’ve had fun playing Ingress, but I love games with leaderboards so I can see how I’m doing. Here’s an unofficial one that will hopefully grow to more than twenty or so people.